As I rolled over, cold air rushed down my back, and I inched closer to my (ex-) husband, Bill, to get some warmth…Ouch! A sharp rock made contact with my hipbone and brought me wide awake. I didn’t move much, just enough to try to see what time it was by my watch. It was early yet, and unless I wanted to bundle up and build a campfire it was best to stay right where I was. Once I was warm again, however, I ventured out of the sleeping bag far enough to look out the window of our tent…Yes, he was there again. Each morning, if I awoke early enough, I could watch the great blue heron who inhabited our mining claim. In the early morning hours he stood just a few feet from our tent, surveying his world. He could be seen during the day flying up and down the creek, but this was the only time to see him “up close and personal.” The cold soon drove me back to my covers, and as I lay there I wondered, not for the first time, how I managed to get myself where I was. It had long been a dream for Bill and our son David to own our own claim. Through diligent research the previous year, they and a friend had managed to locate this one. When they told me about it the first time, I had a sinking feeling that this wasn’t going to be all fun and games. In the first place, it was remote (but they said we could drive all the way in), we would have to tent camp, since we could not drive the camper in, and, although it was only about 35 miles from the campground we were staying in at the time, it took three hours to drive that 35 miles (that was a real bad sign). I didn’t see the claim at all that first year. It was late by the time we finished all the paperwork on it, and they told me it was no place to get caught in the rains. They did enough testing to know it was worth the price, and we settled for making plans for the next year. Although several friends would be partners, none of them would be able to work it during the first year, so we made plans for just the three of us. We were going to take both our 4-inch and our 5-inch dredge, since we weren’t sure which would work out best. Spring finally arrived, and, as ready as we could be, we were off. I was beginning to catch the excitement that Bill and David were showing, but I still had a few butterflies concerning the road. I’d thought, after traveling Hwy. 49 through the Mother Lode area for several years, and the back roads, that I was cured of being intimidated by mining area roads. Both of them had been noticeably silent about the road in to the claim, however, which led me to believe it was not going to be something I was going to enjoy. The first hour of our trip in, we wound up, over and around several mountains, on a narrow paved highway. We left that for a dirt road (one lane) and I was given instructions to watch for oncoming vehicles. It was hard to see very far ahead, but I was watching carefully when we rounded a curve and my heart leapt into my throat–we were on top of the world, it seemed! As far as the eye could see in any direction there were forested mountains, all of them below us, except for one taller one right in front of us across what looked like a bottomless chasm. As Bill slowly rounded the curve, he soothed me by saying that he’d been over it several times, and there was no problem with the road. As I looked across to the opposite mountain I could see a much higher, narrow, steep road hugging the edge of it. I consoled myself by thinking that at least I was not on THAT road. We crept down the side of the mountain, with nothing between us and the edge. Several times it was so narrow that pebbles rolled down, and down, and down…. Bill tried to keep up a chatter at first, but gave it up, since keeping the truck on the road with its full load was like handling a bucking bronco, and I did not trust myself to speak. There were still no trees on the edge, and that was on my side of the truck, of course. I wondered at one point if anyone ever did completely bounce right off the road, because we seemed in imminent danger of doing so. I became ill as each curve put us higher and higher above everything. Finally reaching the top, we pulled off into a meadow to take a break, and I sat on a log waiting for everything to settle back into place inside. The next few miles were breathtaking. Beautiful high meadows full of ferns and many wildflowers, the road banks of deep red earth covered with vines and flowers, and a sky of such a brilliant blue it almost hurt. The air was wonderfully fresh and clean, full of the scent of forest and flowers. Meadows alternated with thick forests of huge pine and cedar laced with little babbling brooks. We soon turned onto a non-maintained road and pulled over to lock the wheels of both vehicles into four wheel drive. About one fourth of a mile further we turned off again, went over a rise, and then…down. Down a steep hillside through new growth trees so close they continually scraped the truck. We had to scramble to close the windows as they thrust themselves inside. As he tried to straddle a rut that was growing ever wider and was more than 15 inches deep, Bill started to say something…Ooops! The truck fell into the rut avoiding a tree trunk, and we had to work our way back out. Then we had to stop several times to move large boulders that had fallen. Soon we arrived at a sharp switchback, and I had to get out and guide to back them both around. Until I returned to the truck I didn’t notice the road. As I buckled up we started down and I caught my breath as the truck went over the edge. It was so steep it was like that long first hill you go down on a roller coaster, only this was very narrow and had large fallen logs here and there. We crept down in low four wheel drive, tilting first this way and then that as we drove up on the bank, in and through deep ruts, on or over logs–anything to stay on the narrow road. Then another steep switchback. No where to turn around, so we took it as wide as we could, and just barely made it. Then down another roller coaster ride, and another one. The trees were so thick I still had no idea how far we had to go, but I was feeling so ill that I knew I couldn’t go much further. I was very relieved when we pulled up and stopped for a break at the bottom of the fourth one. I was looking ahead. I could just catch a glimpse of the creek below through the trees. As I started to get out, however, my foot met nothing but air! I looked down to see the turn in the road badly chewed up with big hunks of shale churned from vehicles trying to claw their way out. It had been torn up so badly that there was at least a 10-foot drop during the turn! Then the road tilted alarmingly where the hillside had slid–tilted so badly that I decided then and there that I was going to walk the rest of the way. I never did ride up to that point, or beyond there going down. It was a walk of a mile or so from the campsite, but much better than riding. It seemed that last mile was just more than my stomach or nerves could handle. When I reached the bottom I found a wide, wide wash. 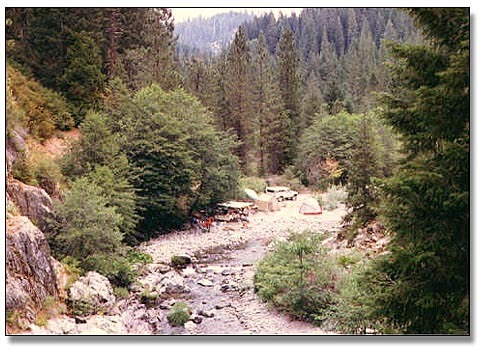 Probably 300 feet wide, with groves of trees near the edges, sand and gravel bars, and a crystal clear creek meandering through on the near side. Our campsite was to be just in front of the sheer bedrock face of a mountain that caused the creek to turn west, then south again, where it had worn through the bedrock and made a channel about fifty feet deep in the sheer sides. Our claim started just above where we were camping, and continued down through the narrow canyon. I did not see the rest of it for a couple of days, as we devoted the first two days to setting up camp. David took the 4-inch dredge down piece by piece in the evenings to where they planned to start dredging. We were at 4,800 feet elevation, and the nights were cold and wonderful for sleeping, but the days warmed up beautifully. It was the most peaceful, serene place I had ever seen. The area was steeped in mining history, and well documented. I had purchased a book that gave us a lot of information on the area. From that book I knew that our road in to the claim had been built by hand to construct a dam right where we were camped, in order to flume water 11 miles across these rugged mountains to hydraulic another mining area. Just 20 feet downstream from our tent, where the narrow canyon began, the two bottom logs of that dam still remained, the top one just breaking the water. Our third morning dawned clear and beautiful, and we quickly made preparations to be gone for the day, since Bill and David intended to dredge first at the lower end of the claim. By the time I was ready they had gas cans, pry bars, and all the things they still needed, ready to go. I put the daypack on my back, grabbed the small ice chest with the shoulder strap that carried our lunch, and we started off. From this point, our only access to the rest of the claim was a trail where the flume had been. There were no “banks” to the creek. We waded across, and started up the bedrock face at the point where the dam had been. There were enough handholds and footholds so that this was not a problem. Up on top there were rotting timbers in a pile, which must have been used for repair on the flume, and the small flat area was littered with square nails. We were about 60 feet above the creek. I could see the trail just to where the mountain jutted out to a point, and then a turn hid it from view. The trail was wide with a flat area on the creek edge, and I was pleasantly surprised. Actually, in all the concerns I had had about coming to this area, this trail had not entered my mind before now, which surprised me, since I have a terrible fear of heights. When we reached the point where the trail turned, I looked back at our camp. I turned back. From this point on the trail was narrower, so I spent all my time looking at my feet. It was also covered with leaves from trees and bushes above, and slick. My feet were still wet from crossing the creek, so I had to step carefully. There was no longer anything between the trail and the edge, and as I followed carefully, I noticed that the creek was getting much further below us. That’s when it occurred to me that the flume would have to stay level, but the natural drop in the creek was a pretty good one, so the further we went along, the further above the creek we would be. I had dropped a little behind since I was going more slowly, so I paid attention to what I was doing, and tried to catch up. The further I went, the narrower the trail seemed to be. With the loaded daypack on my back, and the hard plastic cooler slung over my shoulder I was off balance a bit, and I soon found myself hugging the mountainside and creeping even more slowly than before. Now, this child is talking to a person he knows doesn’t even climb a ladder; who is totally un-athletic, and who is already pretty strung out after the trip in to this claim and the “fun” of setting up camp for two days. I just looked at him, but he remained calm. He continued to talk to me as if I were a child while I stood there with my face pressed to the mountainside, loaded down with gear. I don’t remember anything about crossing that space except that I was lightheaded and dizzy because I had to look down. I did cross it, however, and after that the rest of the trail seemed very good! Bill and David had to spend the rest of the walk listening to what I thought of them for getting me into such a situation, and what we were going to do to the trail to improve it. They wisely made no comment or objection. By the time we reached the point where we were to go back down the mountainside, I was beginning to feel better. On a previous trip down, David had taken a rope. Since the mountainside was so steep and we were now about 150 feet above the creek, he had it strung from tree to tree and cut some steps to help us get up and down. The only problem was that he, being 6’2″ tall, and having the legs of a giraffe, had cut steps for a much taller person. I ended up slipping and sliding down much more of the trail than I wanted to. Numerous times my feet went out from under me trying to negotiate the long steps, and I would bump and slide (usually right into a “stickery” bush) while dangling from the rope by one arm. I had taken a few pry bars in one hand to leave each of them with one arm free. David apologized each time I’d fall, and promised to fix it the next day. By the time I reached the bottom I had big splotches of dirt, scratches, and bruises almost everywhere. When we emerged from the trees at the creek we crossed again (which gave me an opportunity to wash off most of the dirt) and I noticed that it was much cooler. I looked up to see clouds moving in. We were soon at the dredge, however, and we all worked to get it set up and ready to go. Once they’d donned their weight belts and fired up the dredge, I decided to take a break. David had been thoughtful enough to bring a folding chair with short legs–they are great for panning, and a real backsaver. I tried to find a sunny spot since it was now decidedly cold, but there didn’t seem to be one. I picked a flat place, pulled a book from my daypack, and sat down to read. Suddenly, I sneezed six or seven times and my nose started running. Great! Now I was going to come down with a cold. Oh, well….I picked up the book again after digging out the Kleenex, and sat back with a sigh. As I leaned back in the chair, I encountered instant pain on my shoulder blade! It felt as if someone had just stabbed me with a long needle. I jumped up to find I had leaned against a bumblebee! That was it! My nose was running again, my shoulder was throbbing and everything to treat it with was clear back at camp, I was cold, wet, and tired! I stalked off into the trees. Although I’m sure you’d have a good laugh I’m not going to tell you just what I did there. Let’s just say I was riled. When I came back I felt better except that my shoulder was killing me! I rummaged around in the daypack, looking for something I could use, but the only thing I could find was some aspirin. I debated taking a couple of them, but knew from experience that they didn’t help. My grandmother had always used a baking soda paste on bee stings so I moistened one aspirin, making a paste of it, and rubbed it right on the bee sting. I could hardly believe it, but it took the pain away in a very short time. Once again I settled back with my book (this time checking the chair for bees), and started reading. Before I finished the first page..Splat! A very large rain drop fell on the page, and I raised my eyes to look at the sky. I had been so involved with my problems I hadn’t noticed that there were huge thunderclouds above us, and all of a sudden they let go with a terrific storm. We were pelted by huge drops, lightning and deafening thunder. We quickly shut down and covered the engine, and hurriedly started back for camp. Arriving thoroughly soaked, I put a big pot of homemade soup on to cook, and then snuggled down at last in my sleeping bag with my book. It rained all day, and steadily for two more days, which actually worked out quite well. It gave me time to get over my cold, and it gave all of us a chance to rest up from our hustle and bustle. We unpacked the books we’d brought along, and spent most of our time reading while we listened to the rain on the tent, surrounded by the sweet smell of wet pine, fir, and cedar. By the time it was clear again, we were really ready to get busy! The first order of business was to improve the flume trail, however, and when we left camp that morning we carried a shovel and our small camp broom. On our way down to the dredge I swept a portion of the trail clear of leaves, and left the broom at the other end of them, to sweep a portion that night. While I did that, David went ahead and started working at re-cutting a trail into the side of the mountain where there was none. We left both the shovel and broom on the trail until all areas of it had been improved as much as possible. 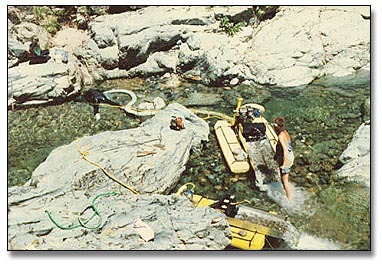 The reason for wanting to dredge the lower end of the claim was because it made a bend near the bottom, and widened out into a series of pools interspersed with clumps of large boulders: an ideal place for gold to come to rest after its headlong plunge through the upper canyon which mostly had very shallow bedrock. We did not have to dredge there very long to find out that many huge boulders had also come to rest in the same pools–they appeared to have been laid in by a master–each of them too large to winch. They were wedged in so tight we couldn’t even dredge between them! After some discussion (always lively in our family) about where we were going to dredge next, a decision was reached and we dismantled the dredge, packed it up the mountainside, across the trail, and back down at the new site. We could not move more than a few feet without having to do this, due to the many huge boulders that were strewn throughout the canyon. In addition to moving the dredge and accessories it was necessary to have boulder moving equipment. We’d made a portable mount for our 8000 lb. electric winch so it could be cabled to a piece of bedrock or large boulder, and set it up in succession with a small generator, 12V battery, and battery charger. It was necessary to have the battery charger to charge the battery fast enough to move several boulders at the same time. That meant that each of these items also had to be moved from place to place with the dredge, since there were boulders no matter where we dredged. Our days soon settled into a routine. While I dressed Bill carried water from the creek. I put some on the stove while I washed up, and the warm water was used to soak lightweight soiled clothing during the day. Once the washing was in to soak I put more water on while I cooked breakfast, and by the time we had eaten, I had more hot water to wash dishes. I packed our lunch while they filled our solar shower bags and put them out on the rocks to soak up sun during the day. We then loaded up our backpacks and were off to the dredge. At the end of the dredging day we cleaned the sluice, screened the concentrates and carried them back to camp with us, along with gas cans that needed to be filled, etc. After climbing to the trail, and then back down again when we reached camp, I washed the clothing that had been soaking all day, removed the clothing hung the day before from the clothesline, and hung up the new. Then, I showered in our shower room and started dinner. By this time Bill and David had finished the cleanup of the day’s gold, and while they took showers I weighed it, recorded it, and put it away. After dinner they gathered firewood while I cleaned camp. Then we could relax around the campfire, but we were ready for bed early. 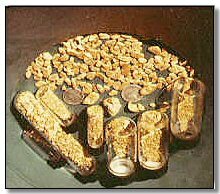 Most of the gold we found was beautiful– chunky, or nugget, gold. 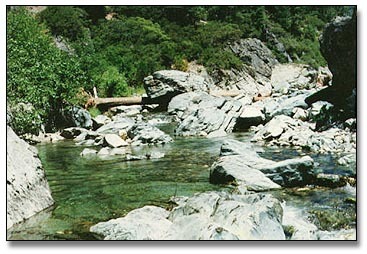 Due to the rapid drop in the creek and the force of water through the narrow canyon we found very little fine gold, or gold in the overburden. Because we left camp unattended all day, we had debated long about where to keep it! Although I was not thrilled with the idea, we finally decided that the only way to keep it really safe was to bury it. There was a large area around camp that was deep, soft white sand. We picked an easily identifiable place between bushes, dug a hole, and buried it. After filling our second jar I went to the spot where we’d buried the gold, dug, and….Nothing! Bill came over to help and soon David joined in. We couldn’t find it! We knew it had to be there, somewhere, so we fetched the shovel to dig out the entire area between the bushes. After digging a deep pit we finally retrieved it, with relief. We’d probably caused it to sink by digging all around it. 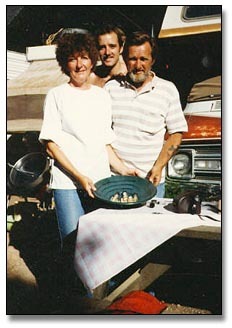 I had a hard time letting it go again, but from then on we placed it in a metal tin, which went into a bag, placed directly on bedrock in an area where bedrock was shallower and marked it with some equipment we weren’t using. We rarely took a full day off since we didn’t know how long we would be able to stay. We systematically worked our way down the creek dredging, and found some rewarding pockets of gold. Two small areas yielded 27 pennyweights apiece. As we neared one boulder almost the size of a house, it paid better and better. The boulder was not sitting on bedrock but sat right on top of the material. When they began uncovering the material around it, they found two boulders on bedrock which were supporting it. The problem was that one of the boulders underneath was at a very precarious angle, and if the large one above had shifted at all, it would have rolled, smashing Bill, David, and the dredge. They kept telling me they would quit working there before it became too dangerous, but they found two coins from the 1840s, and then one from the 1830s, then a 6 pennyweight nugget–they kept getting closer and closer…..All this time I tended the dredge and stared at the rock looming above them. If it had shifted I could probably get out of the way, but they would have no chance to. I knew they were getting nervous about it because one of them kept a hand on the boulder at all times, but they couldn’t seem to bring themselves to stop dredging there. I was beginning to feel panic. How was I going to get them to stop? And, that’s just what I did. They showed up about an hour later. 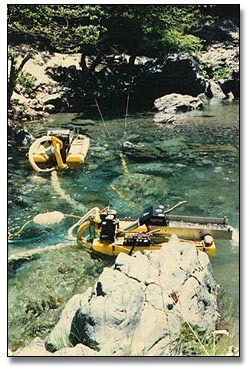 They had already moved the dredge over to work down a small set of falls near the boulder. They never did comment on what I had had to say, but they were pretty sober the rest of the day, so they had done some serious thinking about it. I think they were both ready to move, but each hated to be the one to say so. As we worked down the small set of falls, the gold production fell off some. When they reached the bottom of the falls, however, there was a small pool, and they found some nice crevices carrying gold in the bedrock there. Once Bill came up to the surface of the water and asked me to put his mask on. He’d uncovered a pocket of gold and wanted me to see it. I put it on, and holding my breath I put my face down in the water. Bedrock was only about five feet deep, and the water was so crystal clear the sun was shining through to the bedrock. There, right in a band of sunlight, was an inverted cone-shaped depression in the smooth bedrock, filled with sparkling, shining gold. It totaled one and one-fourth ounces, the largest pocket we’d found. We followed the bedrock down another small set of falls into a larger pool where the recovery was also good. This was also one of the few places where fine gold was recovered; a small bank on one side widened the canyon just enough to let some fine gold settle. Although days off were few, I did take a few mornings to do some baking. All three of us had huge appetites, but we all lost weight (I found the perfect waistline exercise–shoveling dredge tailings!). One morning I stayed in camp to bake a cake. We were working quite some way down the canyon, so David told Bill to stay there with me, he would dredge alone (he wanted cake, too!). We used an oven that sat on our propane stove which had a thermostat. But since it was outdoors, if a breeze came up the temperature fluctuated quite a bit, and it helped to have someone sit there to let me know when the temperature changed. I mixed up the cake, beating it by hand, and put the first half in the oven. While it baked I started some of the cleanup, and was humming along with the radio as I worked. Never has a cake smelled so good, or the scent filled the air as that one did.. David said later that he could smell it way downstream at the dredge. It was a beautiful day, and I had placed a big bunch of wildflowers gathered from a nearby spring, that morning, on our table. Birds were chirping, our friendly chipmunks were waiting in the bushes for any scraps we might have for them, hummingbirds were fighting over the feeder that hung from the edge of our tarp frame, and all was right with the world. Or, so I thought! A year later, after hearing about it from someone else first, Bill related that he had just happened to glance up at the trail when all of a sudden a bear shuffled around the point, headed our way. It had evidently smelled the cake, too! He casually got to his feet and went to the tent, and when my back was turned grabbed his gun from the pack and laid it next to him on his chair, out of my sight. I was still humming along with the radio, cleaning up, and when I burst into song the bear must have heard me. Bill told me the bear looked up and saw us, and sniffed the fragrant air. Instead of coming on, however, he sniffed again, then turned around and went the other way. Knowing that I would leave if I saw a bear, Bill took David aside when he returned to camp for lunch and told him about the bear. David left camp before we did that afternoon, to brush all the tracks from the trail. From then on, he left camp every morning before us and kept the trail swept for me. They enjoyed putting one over on me, and there were no further sightings of any large animals. I was 48 years old that summer, and I really cherish the experiences we shared. Our lives took another direction not long afterward, and I don’t know that I will ever again be able to do something like that. It was a lot of work, but the rewards were great enough to make it very worthwhile. I am not speaking of the monetary rewards, although they were good; the rewards I am speaking of are less tangible, but greater. We did something that not many ever have the opportunity to do today, and that experience will always be with us. We went back to the claim the next year. This time three other families (our partners) and another of our sons went also. That year brought its own unique experiences, mostly good ones, but it just wasn’t quite the same as the year that Bill, David, and I had our “Great Adventure” in the wilderness. And by the way, that pan of gold up there is holding almost all of our “take” for the six weeks we spent there that year; our first pound of gold (1 lb., troy weight) found in a summer!